The Finger Lakes are 11 glacial lakes, all of which are shaped like fingers, located in the central region of New York state. The region is perhaps best known for its impressive gorges, which were shaped by water and ice over some 10,000 years. As the rain water flowed down these steep cliffs, it formed hundreds of Finger Lakes Waterfalls that you’ll find dotted all around the area. Last June we packed up our car and headed out for a road trip in search of these stunning waterfalls. There are so many, we couldn’t possibly see them all during our brief visit. 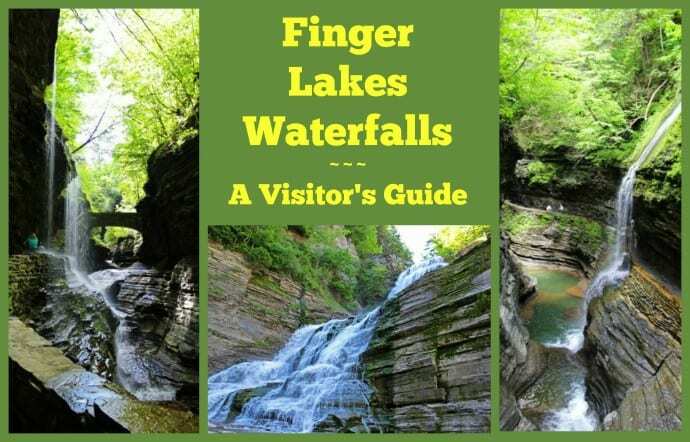 But here are a few of our favorite Finger Lakes waterfalls to inspire your next awesome road trip. 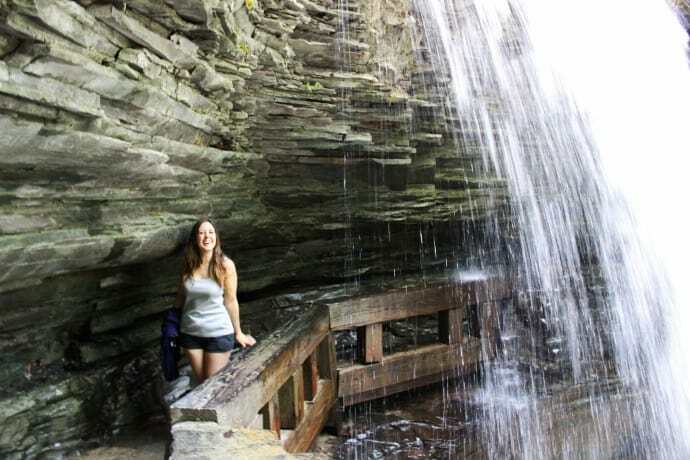 If there’s one place you must stop during your visit to the Finger Lakes, it’s Watkins Glen State Park. 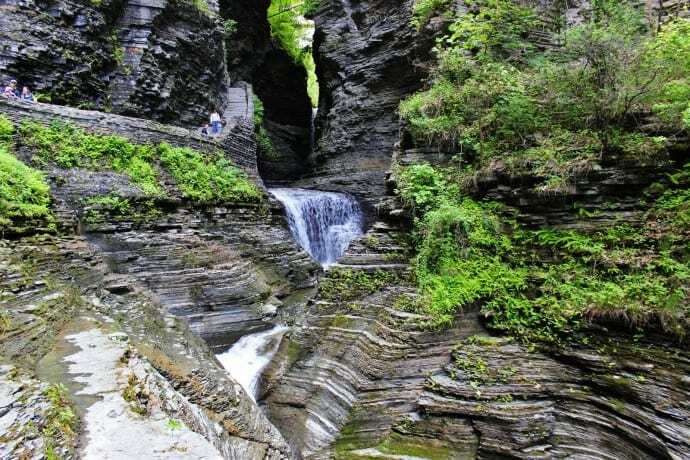 Nestled in the quaint town of Watkins Glen, this park contains a whopping 19 waterfalls. The entire park is only about two miles long, so you can hike the whole thing in half a day. It is very accessible, located right in the middle of town. The path is family-friendly, so bring the kids, the dog, and the entire family to enjoy a day immersed in nature. The park’s main trail is the Gorge Trail. There are 800 steps in total from the bottom to the top, and the path gradually inclines. But don’t worry: You’ll be taking this hike slowly, as you’ll be in complete awe of your surroundings. So it’s truly suitable for all fitness levels. The dramatic landscape at Watkins Glen State Park is like no other we’ve seen during our travels. The water has gradually carved the rocks over thousands of years. Some rocks are made smooth by the river that runs through the gorge. Other rocks jet out unevenly, stacked layer upon layer. There are several interesting waterfalls to see along this hike. The Cavern Cascade is one of two waterfalls that you will walk behind on your journey down the path. Watch out for your cell phone and camera gear, as you might get a little bit wet! But the water’s really refreshing on a hot, sunny day. The Central Cascade is the highest waterfall located in the gorge, plummeting around 60 feet below. There’s bridge that crosses directly over top of this waterfall, providing an alternate bird’s-eye view. The Rainbow Falls is quite possibly the prettiest waterfall we saw during our Watkins Glen hike. This is the second of the two waterfalls that you’ll get to walk behind. This narrow flow of water plunges down through a bed of ferns growing from the rock walls. The Gorge Trail is open from the end of May until November. Be sure to check the Watkins Glen State Park website for details before you visit. 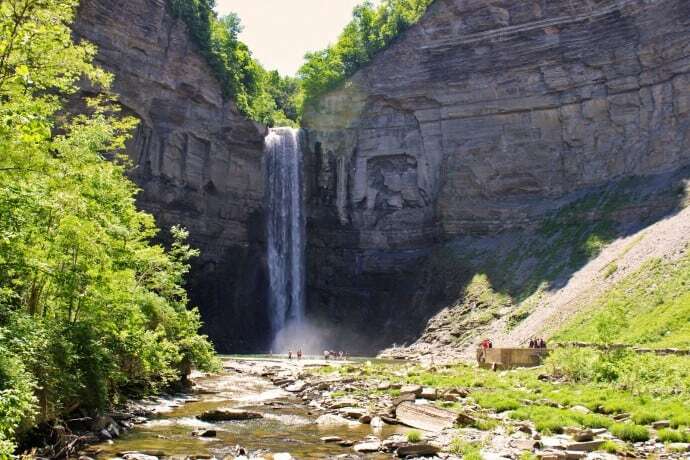 The hike to Taughannock Falls is a relatively short (but scenic) 3/4-mile one, but with a big payoff at the end. The terrain is pretty flat, and the forest is all around you is gorgeous. The most dramatic feature of Taughannock Falls is one big vertical drop, which plunges approximately 215 feet below. To put this into perspective, Niagara Falls only falls 167 feet. So Taughannock Falls is quite a bit taller than Niagara! The waterfall is magnificent, with tall cliffs all around it that stretch up to 400 feet high in places. You can walk up close to the waterfall if you choose, but it’s pretty misty and you’ll probably get wet. If you have some extra time, drive up to the top of the waterfall, where there is an additional parking lot and some pretty panoramic views. 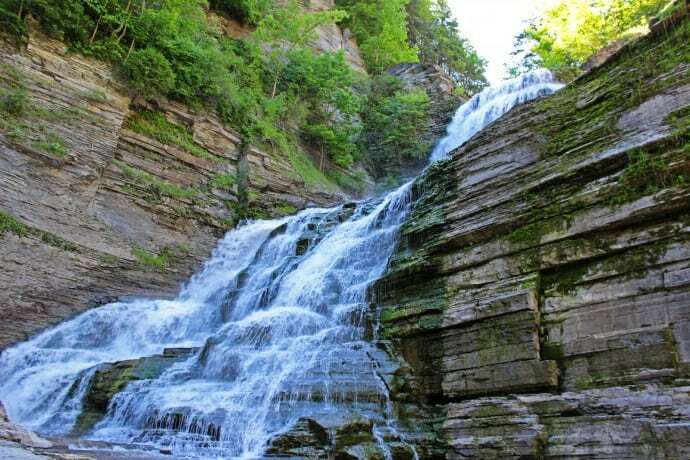 Don’t let the devilish name of this Finger Lakes waterfall scare you off! 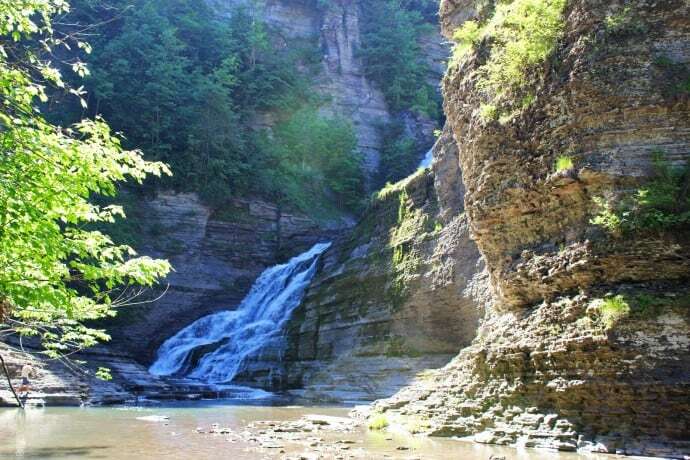 You’ll find Lucifer Falls in Robert H. Treman State Park, which is located near Ithaca. We were easily able to visit both Taughannock Falls and Robert H. Treman State Park in the same day. We parked our car at the upper entrance for quicker access to the waterfall. After a short hike, we found a scenic outlook that offers lovely views of Lucifer Falls. The waterfall has a 115 foot drop, which cascades over many layers of rock. At the viewpoint, you’ll notice a nearby staircase with rocky stairs leading down to Enfield Creek. I highly recommend that you hike down the stairs, even though there are a lot of them. The very best views of Lucifer Falls are from the base of the creek. The walk down is relatively easy, but it’s way more work hiking back up the stairs. Fortunately, the view you’ll get at the bottom is so beautiful, you won’t have time to think about that until you’re already on the way back up! At the base of Lucifer Falls you’ll find a natural swimming pool. If it’s warm enough outside, bring your swimsuit and take a refreshing dip! 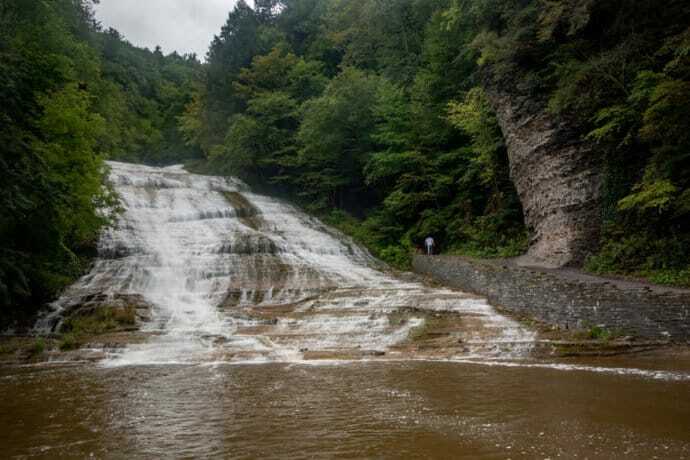 It was still too chilly for swimming when we took our Finger Lakes waterfalls road trip in June. But we did remove our shoes and socks, and then waded through the knee-deep waters to get closer to the falls. Once you reach the other side of the creek, you’ll be rewarded with a brilliant view. This is a great spot to sit back, relax, perhaps enjoy a leisurely picnic lunch, and take in the stunning sights. Visitors can see this waterfall right from the side of the road, so it’s very popular with families containing small children and others who are physically unable to do lengthy hiking treks. It’s a very pretty waterfall that gently cascades down into the river below. In the summer, there’s a sweet swimming area located at the base of the waterfall, which is manned by professional lifeguards. 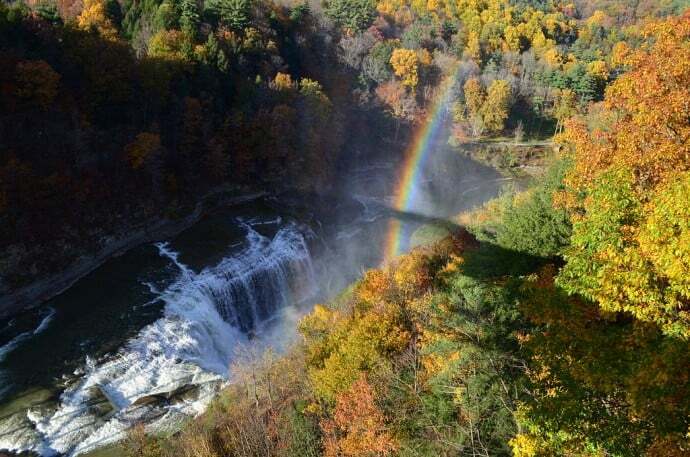 Known as the “Grand Canyon of the East,” Letchworth State Park is a 14,000-acre park situated on the Genesee River. There are three major waterfalls here ranging from 70 to 110 feet high, all located between cliffs towering up to 600 feet in height. There are 66 miles of trails open all year long for hiking, biking, snowmobiling, snowshoeing, and cross-country skiing. The state park also offers impressive vistas, dramatic gorges, and scenic forests. You can even take a hot air balloon ride for a sensational bird’s-eye view! TLC may have once warned “Don’t go chasing waterfalls,” but this part of New York is a dream destination for those who choose to ignore their advice. 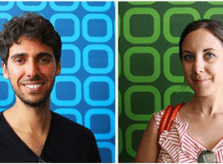 Justin Ceksters and Lauren Yakiwchuk are travel writers, photographers, videographers, and the founders of Justin Plus Lauren. They travel the world together to explore nature, wildlife, and emphasize the importance of ecotourism and environmentalism. 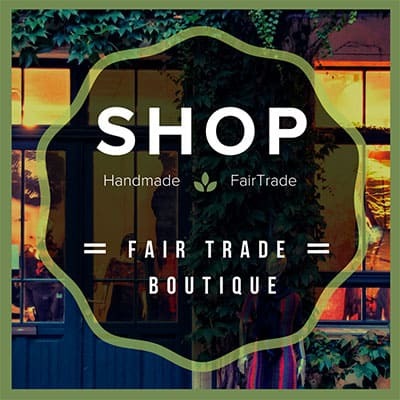 As Vegans who consume a plant-based diet, they are always findig the best places for healthy food. Follow Justin and Lauren on Facebook, Twitter, Instagram and Youtube.